Reving up a wide array of vehicles. Find a full portfolio of flooded lead-acid batteries, each built to meet the needs of our original equipment, as well as our aftermarket customers. Our flooded 12-volt batteries are engineered to support the electrical demands of today’s vehicles, providing reliable starting power in the most trying climate conditions. Looking for a battery that truly stands the test of time? 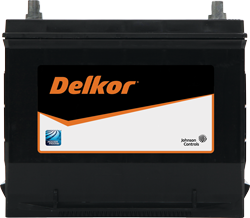 Go for the Delkor flooded battery, which features our exclusive PowerFrame® Grid technology, delivering incomparable strength and durability.